Faith Beyond Belief gives a much-needed voice to the �good� people who have left their church but whose spirituality continues to mature. Johnston uses first-person stories as well as known spiritual authorities in describing various stages of religious growth. Some of these real-life accounts are by nonbelievers; others are by those among the growing numbers of the �spiritual but not religious.� All are thoughtful people with too much integrity to live what they consider a lie. The stories of the nonbelievers-including an ex-Catholic, a former Mormon, and a clandestine Muslim apostate who left his community after the attacks of 9/11-show how complete confidence in human reason can lead away from literal religious interpretation. But, while that step is a necessary one on the spiritual path, it is only intermediate. Her second set of stories are of people at the �mystic� level who can tolerate paradox and see truth and reality as multidimensional. Johnston�s book will help doubters to see things in a new light as well as those who are struggling to clarify their own spiritual vision. It also points beyond the atheist/believer controversy wrecking such divisive havoc in our culture today. 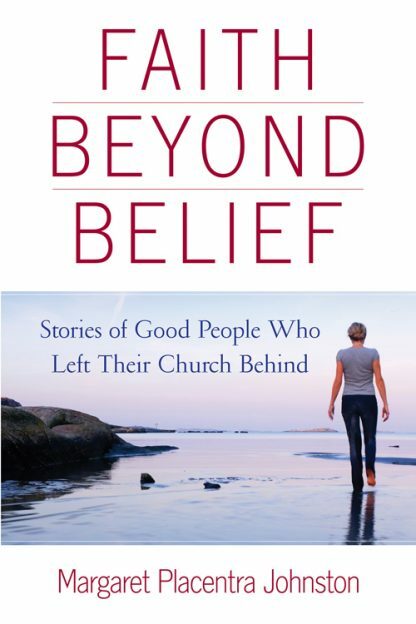 With the publication of Faith Beyond Belief: Stories of Good People Who Left Their Church Behind, Margaret Placentra Johnston is embarking on her third career*. A practicing optometrist, she has been helping people see better in the physical world for the last thirty years. Now she writes to help people see more clearly in other ways. Captivated by the depth and beauty of the universal worldview described by various spiritual development theorists, Margaret found ten regular, real life people whose stories could show us steps on the way to that worldview. Her book, Faith Beyond Belief, is the result of that search. Margaret 's blog can be found at Patheos: www.patheos.com/blogs/faithbeyondbelief. A set of questions for discussion groups, and other information about the book can be found at FaithBeyondBelief-book.com. *high school French teacher, then Optometrist, now author.